I first encountered Eliot as part of the crowd that surrounded Allen Ginsberg -- his "entourage", basically -- but I also heard him read his own poems: moving, well-crafted verses with a humorous Ginsberg-ian self-questioning touch, often containing powerful messages about political activism, about life in New York City, about escapes into nature. 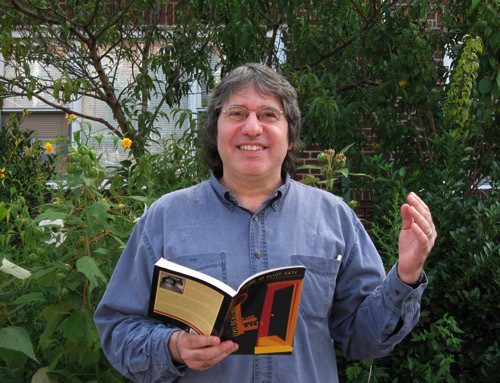 Eliot was the co-editor with Allen Ginsberg and Andy Clausen of Poems for the Nation: A Collection of Contemporary Political Poems and also published two books of poetry, Love, War, Fire, Wind: Looking Out from North America's Skull and Unlocking the Exits . When the Occupy Wall Street movement kicked off last September, I expected to see Eliot Katz around the scene, since I know he's an eager political activist who never turns down a good event. Unfortunately, I learned that Eliot has been slowed down by a bout with Lyme disease, and has been forced to participate in the Occupy movement more from the sidelines than he would have liked. However, the sidelines can offer a good perspective for observation. Eliot recently sent me some notes containing his thoughts about how the Occupy Wall Street movement can best position itself to succeed in the future, and I thought I'd give Eliot a chance to air his ideas out with an interview here. Eliot and I got a chance to talk about some more esoteric and poetic topics too. Thanks, Eliot, and I hope you'll be back in full health again soon. Eliot: First, Levi, let me say that, as a longtime fan of Litkicks, and an occasional past contributor of poems to your website, it has been really nice to see how deeply Litkicks has been interested in progressive politics, including the Occupy movement, and it’s an honor to have a chance to talk with you and your readers about some political ideas. As someone who has been participating in many of Occupy’s major events and rallies and who has worked as an organizer with the OWS poetry collective, I believe that Occupy has already accomplished a great deal in a very short time -- including changing the national dialogue from austerity to economic inequality, putting a larger spotlight on poverty issues in America, and drawing attention away from the right-wing Tea Party that had been dominating press coverage of on-the-ground politics before Occupy. But, if we are going to be honest and self-reflexive, it is also clear that, by the time of this interview in the first days of summer 2012, with some notable recent exceptions like the large May Day protests in NYC, Occupy has already moved into a period of gradual decline. I wanted to offer some suggestions, based on my years of organizing experience, for how to re-energize Occupy, since sometimes strategies that work in the creation and early stages of a movement may need to change if the movement is going to become a sustained and effective one for the long haul. In my view, the horizontal style of leadership -- that is, having no accountable leadership -- worked well in the creation and early stages of Occupy, and the early anarchist organizers of Occupy Wall Street like Marina Sitrin and David Graeber deserve tremendous credit for their vision and commitment in helping to create this historic movement. But I personally still suggest making changes at this point for the sake of the movement’s future sustainability and success. On one hand, the open, horizontalist aspect of Occupy undoubtedly encouraged many thousands of people to get involved and to feel like they had an ownership stake in the movement. But on the other hand, in New York and across the country, this has been an aspect of Occupy that the police and the mainstream media have at times exploited to make Occupy look violent, naïve, and disorganized -- and which has therefore made it more difficult for Occupy to maintain its numbers and momentum, as well as to win over members of the public who might otherwise be sympathetic to Occupy’s cause. Levi, as I think your question implies, Occupy, like the global justice movement which was similarly started mostly by anarchist organizers, has so far seen itself purely as a mass movement or as a caller of mass actions, and not as a political organization with an accountable leadership structure. And throughout history, mass movements have certainly helped change American politics and laws for the better. The Freedom Rides of the civil rights movement would be just one example. So that I do hope, even if Occupy keeps its current structure and strategies, working solely as a mass movement, that it will continue to have a positive impact on American politics and culture for at least some time to come. But I believe that the Freedom Rides were able to have a stronger and more permanent effect on American politics and culture because there were organizations like SNCC and the NAACP to help press and implement the mass movement's demands with government. I’m afraid that, with Occupy, as with the global justice movement, there really are not any obvious influential, companion progressive organizations, so that I think it would be helpful if Occupy itself could both keep its mass movement character and also create a democratically structured organization at its core, in order to avoid finding its numbers and influence continuing to gradually diminish over time as has been the case with the global justice movement in the years following the successful 1999 protests against the WTO in Seattle. I also think it will be important for Occupy to continue to build ties with the organizations that are out there and doing what could be considered work that overlaps with Occupy’s goals--including labor unions, environmental groups, and civil and women’s rights organizations. Levi, you ask whether creating this sort of leadership structure might cause Occupy to lose what has been great about the movement. Actually, I’m hoping it could do just the opposite, that it could help keep Occupy alive as a growing and influential movement, a movement that I think is clearly in danger of losing its numbers and influence if changes aren’t made. In a longer piece that I’m working on, I’m also going to explore some of the things that I think have given Occupy its unique character and strength, including its organizational flexibility -- with different working groups that activists and artists with wide-ranging interests could join -- and its welcoming slogan “we are the 99%,” which did such a great job of concisely highlighting the problem of economic inequality in America while portraying the movement itself as welcoming and inclusive. I believe, or at least I hope, that a democratically structured organizing committee could help make sure to expand on those aspects which have given Occupy its strength and help patch up what have been the movement’s weaknesses. Levi: One of the biggest divisions within the Occupy movement, as well as the larger world of Occupy supporters outside the movement, is whether or not to engage in electoral politics within the United States of America to effect change. I have personally seen this debate became extremely ugly and unfriendly -- emotions are high on all sides. As a long-time progressive activist, do you think there is any hope for electoral politics in the USA? Will you be following Obama vs. Romney closely, and do you think it will make a big difference who will win this election? Eliot: I believe that elections and voting are crucial, even if they are only part of what makes for a vibrant democracy. If one reads, for the best example, Howard Zinn’s A People's History of the United States: 1492 to Present , one can see how progressive movements outside of electoral politics have helped reshape American history for the better. But I do think it matters greatly who is in the White House, the Congress, and the Supreme Court. I also think that it’s significant that OWS was created during the Obama administration, since most effective social movements seem to form under administrations (like FDR’s or LBJ’s) which large numbers of people believe can at least potentially be moved to take action if there is sufficient pressure from below. I think it would be good if, during election seasons, local Occupy groups decided to support progressive candidates for local or national offices, candidates -- whether Democratic, Green, or Independent -- who support Occupy’s goals and ask for its support. Abbie Hoffman used to talk about the best stance for activists being one foot in the system and one foot in the street. But, in general, although I hope that Occupy protests will help encourage elected officials to take more progressive positions on significant policy matters, I don’t think it is Occupy’s role as a movement, at least in these early stages, to get too deeply involved in the daily activities of electoral politics, and certainly not in the presidential election, where Obama, who has governed largely as a centrist, isn’t about to ask for Occupy Wall Street’s help. But I also think it’s a mistake for influential Occupy organizers, including a few that I have heard on WBAI radio’s nightly OWS news show, to tell young people that elections aren’t that important. It will make a difference, both to the likely success of the movement, and to the lives of millions of people in the U.S., who is elected to our next Congress and our next Presidency. In the long run, I believe that it would be great if we could start working to make structural changes to our election procedures -- like instituting instant run-off voting and proportional representation in as many states as possible -- that would make 3rd and 4th party electoral campaigns more viable. Until then, even if there is not as much of a difference between the two major parties as we would like, I think we should recognize that there are indeed qualitative differences between them. With some admittedly sad exceptions, the Democrats generally advocate for larger budgets for safety-net programs like rental assistance, food stamps, and college grants. Even if these budgets are still much smaller than they should be, these party differences are tangibly felt by millions of people in the U.S.
Levi: You've worked closely as a political activist not only with Abbie Hoffman but also with Allen Ginsberg. I wish either of them were here in 2012 to offer their wisdom and guidance. If either were, what do you think they would be saying right now? Eliot: It was definitely a pleasure and honor to be able to work with Abbie Hoffman on some student activist projects in the late 1980s, when my partner at the time was Abbie’s favorite student organizer, and to have been a one-time student and longtime friend of Allen Ginsberg’s from 1980 until his death in 1997. And it is also a pleasure to be able to continue to do some work with Bob Rosenthal and Peter Hale in Allen’s office, and with Johanna Lawrenson, Abbie’s wife and long-time co-organizer. I think it’s significant that Bob, Peter, and Johanna have all supported the Occupy movement, with Bob and Peter donating a poem of Allen’s to the Occupy Wall Street poetry anthology and donating books of Allen’s to the OWS people’s library, and with Johanna participating in many of Occupy’s events and rallies carrying the banner of the Abbie Hoffman Activist Foundation. But, Levi, after giving you much longer answers to your first few questions, I can give you a really short answer to this one--which is that, on principle, I always avoid pretending to be able to speak for people, even friends, who are no longer with us to confirm or deny whatever I might be tempted to contend they would say. I believe that all we can do with our influences, which in my case would also include organizers like Martin Luther King and Rosa Luxemburg, is to study how they responded to their own historical challenges and to try our imperfect bests to apply those lessons to our own times. Levi: I'm intrigued to hear you mention Rosa Luxemburg as a personal inspiration of yours. I'm not sure how widely she is known today, but I've read a bit about her, and can't help feeling a pang of sadness and anger at the mention of her name. Many people today don't realize that there was once a Marxist revolution in Germany, following the end of the First World War. Rosa Luxemburg was one of the leaders, though she was reluctant to see the revolution move forward in the wake of the military disaster, believing that Germany was not ready. She was right, and was brutally killed in a counter-revolution that presaged the beginning of Germany's Nazi future. What is it about Rosa Luxemburg's legacy that you consider meaningful or relevant today? Eliot: For me, Rosa Luxemburg is an important figure because, in the late 19th century and early 20th century, during some of the heated international debates about socialist theory and what a socialist society might look like, Luxemburg was one of the most influential writers and activists advocating for a democratic form of socialism, arguing that socialism was supposed to lead to a more democratic society, not a less democratic one -- that it was supposed to give working people more of a say in the political and economic decisions that affect their lives. Personally, I’ve never been all that concerned with political or ideological labels, except for the ways in which they sometimes help to make it easier to communicate ideas. Depending on who I’m talking with, sometimes I call myself a democratic socialist, a democratic leftist, or a progressive. In the U.S., unlike in many other countries, because of the experience of the Cold War and the narrow way in which history is often taught in American high schools, sometimes it makes things more difficult to talk to people if one uses the word “socialism” even in its democratic meaning -- although we do have a few officials, like Vermont’s Senator Bernie Sanders, who have even been elected to political office while calling themselves democratic socialists. But because of the political history of the 20th century, the language that works for progressives in France, Sweden, Brazil, or Venezuela may not work for progressives in Poland or the Czech Republic. Levi: Eliot, I first knew you as a poet, working consciously (I believe) in the tradition of the Beat poets. Poetry, and literary awareness in general, has been a big part of Occupy Wall Street's positive self-image, especially as expressed in the Occupy Wall Street library, and the various Occupy poetry anthologies like the ones you mention above. Do you think that poetry and politics are essentially linked? Can one be a great poet and a political idiot, or a terrible poet and a political genius? How do you balance both traditions within your own life? Eliot: As someone who has been writing poetry and doing political activism for over 35 years now, you can probably guess that these are questions that I’ve been thinking about for a long time. Sometimes, I spend my energies as a poet, sometimes as an activist, and sometimes as someone trying to help build more connections between poets and activists. And sometimes, especially these last few years while I’ve been dealing with health issues related to Lyme disease, I spend way too much time watching tennis, basketball, and escapist comedy and detective shows on television! Levi, as a former Queens-based writer who wrote about baseball, you might be happy to know that, lately, I’ve been enjoying watching Mets baseball games when their 36-year-old writer and knuckleball pitcher, R. A. Dickey, is scheduled to throw. Getting back to your question, let me say that, although many -- probably most -- of my own poems deal in some way with political issues, I’m very non-dogmatic about this stuff and don’t think that all poems are political or should be. As humans, we need insights and provocative questions in so many different areas of life: dreams, desires, fears, love, loss, health, trees, travel, etc. And, in answer to one part of your question, sure, there have certainly been great poets, like Ezra Pound and T. S. Eliot, who I think have been politically naïve, and also many terrific political thinkers who write verse that ends up sounding somewhat flat as poetry. And since I do write a lot of political poems, I’ve spent decades practicing trying to write political poems that are lively and interesting as literature. When my longtime friend and Long Shot literary journal co-founder, Danny Shot, and I were both starting to write poetry, Danny sent Allen Ginsberg one of his earliest poems after we met him at a Rutgers poetry reading, and Allen generously sent back a postcard with some advice about poetry that I’ve never forgotten: “each line should have some haiku or double joke or image or mad sound or Poetry in it, not be just flat prose. I think Allen’s own poetry is a great example of how to turn political ideas and observations into memorable poetry, into poetry that transcends “flat prose.” In some essays that I’ve written, including a long one called “Radical Eyes” in the multi-author collection, The Poem That Changed America: “Howl” Fifty Years Later, I’ve tried to look at how Allen and other political poets have used poetic techniques like clear imagery, surrealism, personalization, mythification, demystification, humor, formal inventiveness, and the element of surprise to write poetry that has literary value -- or, in the words of the poet Denise Levertov, to write verse that is “poetic" and not only versified ideas. In the last 50 or 60 years, there has been a strong tradition of poets -- and also poetic songwriters like Woody Guthrie, Pete Seeger, Bob Dylan, Bernice Johnson Reagon of Sweet Honey in the Rock, Joni Mitchell, Buffy St. Marie, Phil Ochs, Gil-Scott Heron, and so many others -- making important contributions to the civil rights, anti-Vietnam war, women’s rights, and gay liberation movements. In the early years of our new century, over 10,000 poets contributed work to the website, poetsagainsthewar.org, to express opposition to the 2003 invasion of Iraq, and to help support the then-growing anti-Iraq war rallies. So it has been great to see this political-poetry tradition being extended during Occupy Wall Street. From the earliest days of Occupy, poets in Zuccotti Park were working to bring Poetry Assemblies into the park, to create an Occupy Wall Street poetry collective, and to compile an Occupy Wall Street poetry anthology to help build today’s movement. Since we have so many deep-rooted social and environmental problems that need to be fixed, we can only hope that the recent renewal of political activism and the recent renewal of political poetry will both continue to grow, like much-needed medicinal herbs, into the future. Note: this interview is the third in a series. See also Talkin' Occupy With Vanessa Veselka and Talkin' Occupy With Mickey Z..
4 Responses to "Talkin' Occupy With Eliot Katz"
Excellent interview: Levi – great questions, Eliot – great answers. Well done gentlemen. P.S. Levi--i've been meaning to tell you this. your captcha is hella hard to read man. one word is easy but the second word always confuses me because its so smoooooshed together. I like the idea that even if someone decides to work outside the two party system, it's still a good idea to vote in elections. Think of it this way: If the best citizens among us don't vote, what kind of president do you think we'll have? If you vote, even if it's for the "lesser of two evils" you'll at least get someone who may be receptive to your ideas. We got to steer this ship. Great questions! I loved all the asides in Katz’s answers. It felt like I was listening in a private conversation. I kept wondering how I would answer the questions if I were part of the conversation, particularly, “Do you think that poetry and politics are essentially linked? Can one be a great poet and a political idiot, or a terrible poet and a political genius?” I appreciated Katz’s response that poetry is part of many different aspects of life. I think in some way, then, politics is also part of so many aspects of life—but I don’t just mean politics in terms of political parties; I mean the politics of our hearts, our actionable beliefs. To use a personal example, if I say I support Greece during its economic crisis, then my spending habits, travel plans, etc., should reflect this. I would’ve been curious to have “political idiot” fleshed out more, for a political idiot isn’t necessarily someone who just has an opposing view.